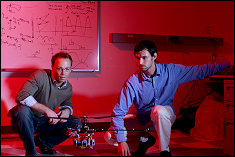 Dr. J. Sean Humbert and student Joseph Conroy of the Autonomous Vehicle Laboratory have focused their research efforts on understanding biological sensory systems and sensorimotor architectures. Dr. J. Sean Humbert and his students in the Autonomous Vehicle Laboratory (AVL) have focused their research efforts on understanding biological sensory systems and sensorimotor architectures. For the visual sense, they take their cues from insects which make use of the changing patterns of luminance on their retina to navigate. ?Optic flow generated during motion contains information regarding relative proximity and speed with respect to objects in the local environment,? says Humbert. ?Insects have evolved specialized neurons, sensitive to wide-field patterns of motion, used to extract these critical visual cues.? In Humbert?s lab they have been able to mathematically formalize the operational principles of this unique sensing capability and are working with industrial collaborators and the Air Force Research Laboratory to transition these concepts into the field.